Almec: I welcome you as a servant of the People, but I’m troubled by the false rumors that brought you here. Mandalore would never turn against the Republic. The duchess Satine values peace more than her own life. Kenobi: Oh, I’m aware of the Duchess’ views. Almec: Master Kenobi, Mandalore’s violent past is behind us. All of our warriors were exiled to our moon, Concordia. They died out years ago. Kenobi: Hmm… Are you certain? I recently encountered a man who wore Mandalorian armor, Jango Fett. Almec: Jango Fett was a common Bounty Hunter. How he acquired that armor is beyond me. • Jango Fett was involved in attempts on Padme Amidala’s life - a very respected and influential senator from Naboo. • If we take into account also Legend sources like Jango Fett: Open Seasons, Fett was (wrongly) accused of genocide of defenseless people on Galidraan, and since at the request of the legal government Jedi “took care” of Fett and his True Mandalorians I think some people may have access to raport of such accusation against Jango. At the same time Dutchess is rumored to have an agenda against Republic & Jedi and I guess it’s easy to make conspiracy theory about Fett working for Satine’s ill intentions due to some nationalist motives on his part (a Mandalorian killing to make Mandalore great again, and so on). For me, Almec claim comes down to the simple fact that Jango Fett at that time was just persona non grata; a politically incorrect figure. I highly doubt Almec cared at all about Jango as a person or his role in Dooku’s plan or his connection to Great Army of Republic, but his statement wasn’t made due to Jango’s color skin or place of born. Fett wasn’t one of New (pacifist) Mandalorian and for sure his past achievements arouse if not disgust on pacifist Mandalore then at least a lot controversy. Also, from perspective of times, Almec is so trustworthy like Palpatine was and we all know where trusting such politicans really leads. Spoiler for those who don’t know: straight to hell. The whole scene in Mandalore Plot was upsetting on many levels, but like I said, for me Almec’s claim was nothing more than politician trying to cut off from politically unacceptable person on pacifist Mandalore in difficult times when Dutchess was trying to keep neutrality in galactic military conflict. Somehow Disney (and Company’s hired authors) take Almec’s claim about Jango Fett at face value. That Disney is erasing previous sources is nothing new, and fine, if they don’t want Open Seasons’ origin of Fett. I can live with him not being officially considered as born on Concord Dawn, but erasing his (and Boba’s) status of Mandalorian Warrior/Bounty Hunter? What the hell is wrong with you, new canon/Disney? “Despite having no affiliation with Mandalore, Jango Fett wears the armored uniform that helped make the Mandalorians a dreaded name”. 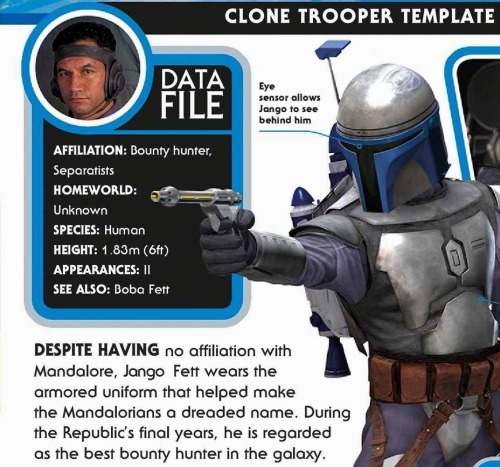 Similar remark may be found in Star Wars The Visual Encyclopedia (2017), how Mandalorian armours is used by Mandalorians and others warriors like Jango Fett. Unfortunately, I do not have the original version of the guide or scans with english text to present here (I still hope that maybe just translator screwed up the matter, but it seems not the case).